Pete Nelson has been fishing with us for years now, and we’re always glad when he comes up. 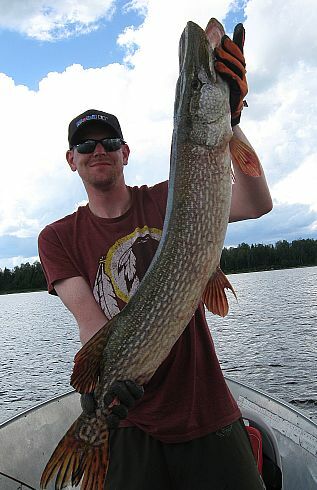 This year he was nice enough to put together a list of fishing tips for Lount Lake. If you’re thinking about visiting Lount, this is a must read. It’ll make your trip so much better. But what about those walleye? I’d never fished for them before, at least not on purpose. You’re supposed to jig deep for those and I’m a cast-and-retrieve guy. Off we went on our first trip to Lount, my older son and me with our bass tackle and two friends with jigs and live bait. I figured I’d have fun with pike and smallmouth and if I could catch an occasional walleye by accident in Virginia I’d probably catch a few in Ontario. Boy, were we all in for a surprise. The bass fishermen with their spinnerbaits, crankbaits and spoons out-fished the jiggers on walleye. Maybe the Virginians just got lucky or maybe those mid-westerners were cursed, but after a couple of days of the same we were all “bass fishing” and catching plenty of quality pike, walleye and smallmouth. 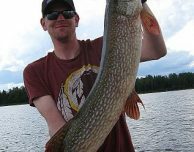 When talking to friends who are planning their first trip with me to Lount the most common questions involve the kind of tackle they need to catch the native walleye and northern pike. For bass fishermen like us there is no need to over-think this. Bass tackle will work just fine. I do suggest that you bring a variety of lures to match the various structure, cover and depths you will find at Lount. Wire leaders are a must as the toothy leviathans are quick to cut your line. I also recommend snipping a hook or two off of your trebles to facilitate the release of fish unharmed. Don’t use trailer hooks, they will just get lodged deep in fish that aren’t going to short-strike in the first place. I bring medium to medium-heavy casting rods in 6 to 7-foot lengths and spool my reels with a variety of braid, fluorocarbon and monofilament. I have fished with die-hard spinning rod fishermen who have done just as well. 12 to 17 lb. test is fine for your floro and mono. The Lount Lake water is a little stained so line color seems to make no difference, nor does the presence of wire leaders. If I had to choose just one lure to take to Lount it would be a gold spoon, 3/4 to 1 3/4 oz. Good for all species, I have caught more trophies on this lure than any other. Other favorites are titanium spinnerbaits (a standard wire bait can be bent beyond repair by a large pike), large jointed Rapalas, swim jigs with 4-inch Gulp! bodies, Rat-L-Traps, lipped crankbaits and flukes. For your soft plastics bring a bunch – they may only last a strike or two – and consider the durable “ElaZtech” kind. Of course topwater is always fun for the smallmouth and northerns, and you’ll even catch the occasional walleye on the surface regardless of what traditional walleye anglers may say. As for the lake itself, Lount is a 40-square mile section of the English River. Fortunately the hottest fishing spots are within a 3-mile radius of the cabin. Here’s a map as provided by NFF-IO with labels (in red) of the hot spots and the informal names we’ve given them over the years. 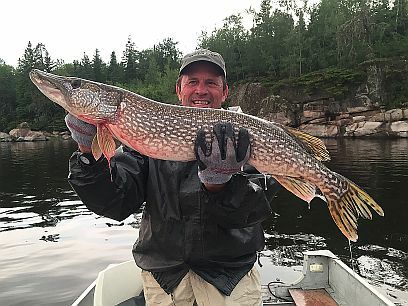 “Trophy Bay” is a 2-mile boat ride east of the cabin and earned its name because we’ve caught more large pike and walleye here than all other parts of the lake combined. It also has some rocky banks and boulder fields for fine smallmouth fishing. A nice thing about Trophy Bay is that there are sheltered areas for when it’s windy and a mile or so of open water for drifting across the extensive weed beds in a breeze. Virtually the whole bay has standing weeds holding ambush-ready monsters. The north shoreline is a cliff-face offering a sheer drop. The south shore is marshy. There is not a place in Trophy Bay you can cast and not hook up. 3 miles southwest of the cabin is “South Bay.” There is a long narrows leading to it that offers shallow, marshy shoreline punctuated by fallen timber and sheer rocky drop-offs. The contours of the land funnel the breeze up or down the narrows, usually making for easy drifting. 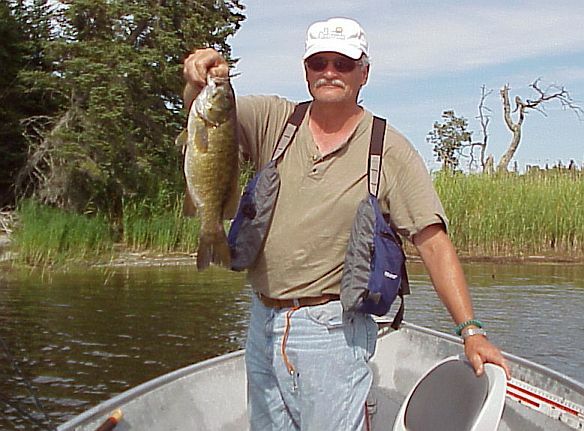 There are a fair number of walleye and pike hiding in the narrows, and if you like to cast to structure bass fishing style this is a good place to do it productively. The south end of the narrows opens up into South Bay. This is deceptively small on the map but it’s a pretty big body of water. The north end is shallow and weedy (and pikey). The rest of the shoreline is mostly rocky. 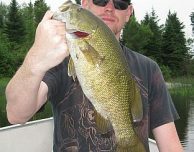 There is a boulder mound near the north end that holds smallmouth and walleye. A little further south is a rocky island where the smallies lurk. 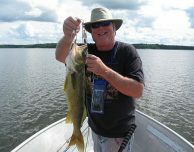 The open parts of the bay, mostly a little deeper than Trophy Bay, hold many walleye, particularly just north and west of the island. This is a great place for deeper running crankbaits and swim jigs. Many daily limits of wallies have been harvested here before lunch. 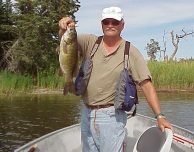 One of the best smallmouth areas for sheer numbers if not size is “Bass Bank,” the western shore of our cabin island. This is a long shore with rocks and boulders extending from the water’s edge down a gentle slope into deep water. Just northwest of the cabin island is a smaller one. The moderately deep straight between these islands holds walleye. Depending on the wind direction this can be a sheltered place to fish on windy days and you don’t have to motor far to get there. 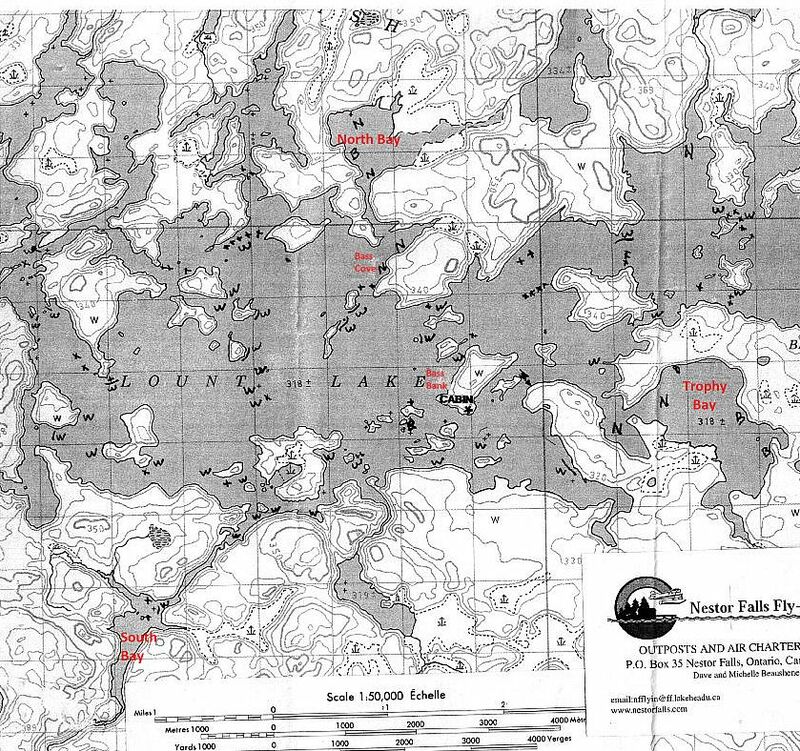 A mile and a half northwest of the cabin is “Bass Cove.” The south shore is rocky with numerous boulders and a gradual slope to deeper, weedy water. This shore extends from the extreme western point that juts into the main lake over a half mile toward the end of the cove. This is prime smallmouth habitat – at least when the lake level is not low like it has been the previous 3 years. 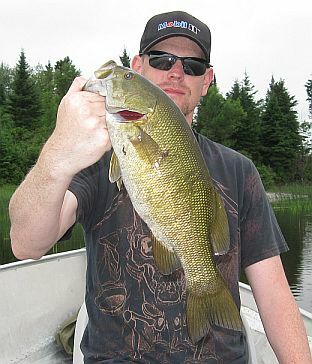 In times of normal-to-high water this is a great smallie spot where 3-4 pounders are common and the occasional 5-pounder can be caught. The last three trips with low water not so much. Some large pike have been caught here regardless of water level. Motor up the narrows from Bass Cove and you’re in “North Bay.” Like Bass Cove, during times of normal-to-high water you’ll find good smallmouth habitat among the rocky shoreline areas. Again, the past 3 years of low water the smallies have been elsewhere. The bay offers lots of walleye and northern regardless, but is weedier in the shallows than Trophy Bay and in parts is deeper. The narrows leading to North Bay is weedy and of course pike love weeds. During normal-to-high water there are plenty of wallies here, too. The rest of the lake is very fishable as well, and there are areas we haven’t given names that are worth exploring. My experience is that the fishing is best in the less turbid bays out of the river current. I have mentioned water level a few times. I have fished Lount at both extremes, a difference of about 6 feet between very high and very low. It’s a different lake at the extremes. Fishing patterns – and landmarks to navigate by – are considerably different between high and low water. As it is always with fishing, adaptability is the key. 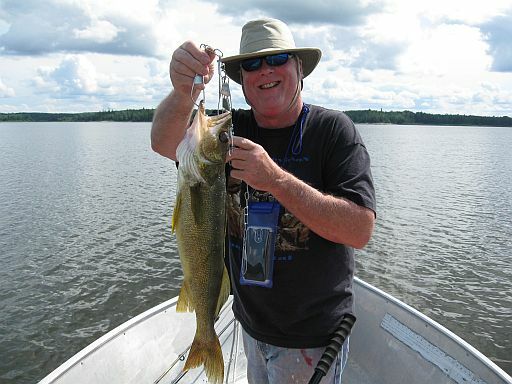 The bottom line is that a southern bass fisherman will feel right at home on a northwestern Ontario lake, except that its much easier to catch your limit each day – and bass just can’t compare to lake-to-pan walleye.